IS it actually a fact that the cost of distribution has risen out of proportion to the cost of production? In 1870, 10% of the population ten years of age and over engaged in gainful occupations--10% of the entire energy of the nation--was engaged in the process of transporting and distributing our commodities. Ten years later, this had increased to 11%. In the next ten years it increased to 14%, and by 1900, it had risen to 16%. This indicates an average rise during the thirty years ending with 1900 of about 1½ % per decade. Beginning with 1900, the rate of increase was progressively more rapid. In the ten years ending with 1910, it jumped to 20%, an increase of 4%, and in the ten years ending with the census, of 1920, it jumped to 25%, an increase of 5% for the decade, or ½ % per year. 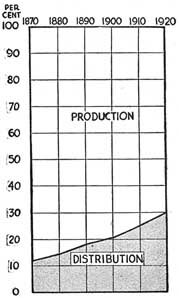 During the same fifty years, the portion of the population engaged in production decreased from 69% to 60%. In the twenty years from 1900 to 1920 it remained practically stationary. 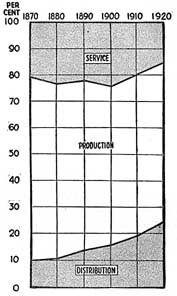 In other words, since 1900, when the energy devoted to distribution began to increase most rapidly, the energy devoted to production has stood still. Table 1 gives the figures not only in percentages, but also in total number of persons. It shows that, while the 8,629,892 persons engaged fifty years ago in production practically tripled their number by 1920, the 1,191,238 persons engaged in trade and transportation increased to nearly ten times the original number. By eliminating those engaged in professional, public, and domestic service, as is done in Table 2, and comparing only the numbers engaged in production to those engaged in distribution, this index shows a drop in human energy devoted to production of from 88% to 70% during a period when energy devoted to distribution increased from 12% to 30%. This index, however, ignores the fact that the relative wages and salaries paid to those in the two groups are not the same today as was the case fifty years ago. Fifty years ago, salesmen and clerks, railway men and drivers, and all others engaged in distribution, were not so well compensated as they are today. Today, salesmen and advertising men are much better paid than craftsmen and superintendents, and they enjoy an increasing premium as business attaches more and more importance to distribution and less and less to production. It should therefore be borne in mind that not only have the numbers engaged in distribution increased, but their average compensation has increased more rapidly than the average compensation of those engaged in production. Plates I and II show graphically the gradual decrease in the ratio of energy used in production and the corresponding increase in the ratio of energy used in distribution. Even at this rate of progression, we shall within the next fifty years have one man engaged in distribution and transportation for every man who is engaged in farming or manufacturing. As a matter of fact, it is exceedingly probable that we shall attain this situation within the next twenty-five or thirty years, because the increase in the population devoted to distribution is progressively greater each year. Since human energy is always paid for, it is perfectly obvious that when we buy anything today we are paying proportionately much more for distribution and much less for production than we were fifty years ago. In addition to the economic loss involved in this change, an even more melancholy fact is disclosed by the figures in Table 1. The numbers engaged in distribution are evidently being recruited almost entirely from the ranks of those who normally should engage in professional, public and domestic service. Our university graduates are in increasing numbers turning to business life rather than to professional life. Socially, a successful advertising man rates higher than a successful professor. Impressionable youth makes the former the object of hero-worship rather than the latter, and naturally money making becomes its goal in life rather than social service. Only one field of endeavor in the United States is in more need of new and idealistic blood than teaching and preaching and the professions generally. That is, of course, the field of cookery and domestic economy. And this field is also being drained of promising cooks and housekeepers in order that the demand for sales-clerks and stenographers may be supplied.